72 Hour Cancellation Notice Period Required for all group Bookings. 50% Deposit payable in advance to secure booking. 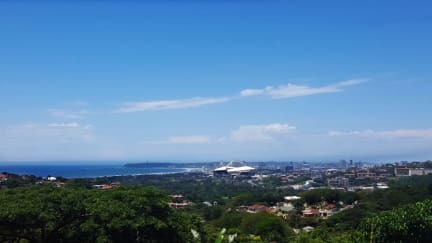 We are a small cozy backpackers just starting up in beautiful Durban North. Our goal is to run this place like our home. With lots of love and always with an open mind. Air-condition, BBQ facilities, common rooms and a kitchen are all available. Come, laugh and relax with us! We are situated in a quiet and save part of Durban just 10 minutes away from the City of Durban. Not only is there a lot of nature and culture around to explore, but also a Beach Buggy available to drive you to town, to the beach, waterfalls or simply to few bars and discos to enjoy the nightlife. Durban is one of the biggest cities in South Africa, rich with Indian culture (weird right?!) and has many bars and lots of activities to offer. A surfing paradise ... for beginners as well as for professionals! As in many places around the coastline in South Africa, the beaches are stunning and the waves simply great for surfing. You can choose between many surfing spots, and diving areas, to swim with sharks, dolphins or simply enjoy the beautiful underwater world through diving trips. Our Sunset Room consists of a Queen Bed, with Dressing Table and Mirror and views of the Beach, Stadium and City. Our Watering Hole Room consists of 3 Single Bunk Beds, Hand Crafted and made by ourselves. Each Bed has intertior Curtains for privacy. Payment upon arrival by cash or EFT Payment. Check in and Check out at any time as long as you inform us about the time in advance. Breakfast not included. Meals are at additional costs. 24 hour Reception, there is always someone on the premises.